The attached photo is of a plate that I cannot determine both the origin or the pattern. This decoration first occurred on the end papers of a fine edition of Buddhist sutras and chants compiled by Imperial order of the Yongle emperor in 1419 and 1420 - i.e. very early during the Ming dynasty. These books are still extant. The decoration was also first used on Yongle Imperial porcelain of this time and is seen as a sign of his conversion to Buddhism. The decoration got popular and was widely copied during the centuries to follow, and are in fact still used in a modernized version. 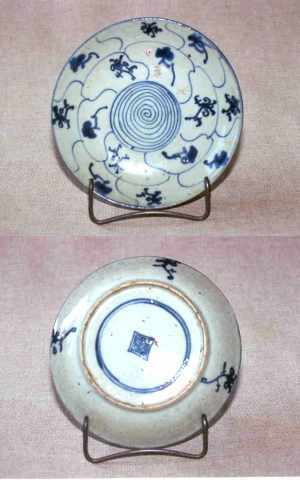 Your dishes are most probably made in the mid 19th century, during the Tongzhi 1862 - 1874 period. Regarding its place of production it is also - most probably - Jingdezhen, Jiangxi province.